It was a pleasant weekend for home teams in LF2 with all of them celebrating a victory. Roche Vendée's supporters finally had something to smile about after their team's first victory of the season. Veuillez trouver en bas de la page un résumé en français de la 4ème journée en LF2. Roche Vendée beat Dunkerque Malo (69-65) despite playing worse than their opponents. Roche Vendée had a poor day from the charity stripes with just 11-from-24, turned the ball over 19 times and yet due to hitting a couple more three-pointers won against their guests from Dunkerque. Dace Pierre-Joseph from Dunkerque should look back at this game and ask herself what happend at the free-throw line because she was 4-of-12 while her team finished with 17-of-29. 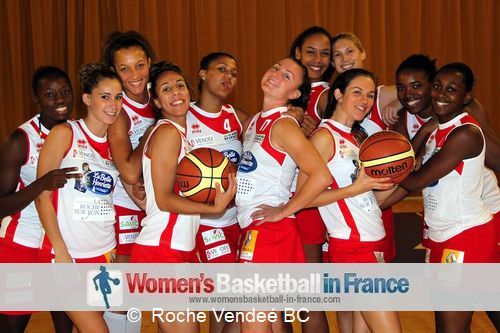 Johanna Tayeau from Roche Vendée was the leading scorer in this game with 15 points. Léon Tregor 29 bounced back from the heavy defeat in round three by defeating the CFBB (65-53). The CFBB could not keep control of the ball and turned the ball over 21 times which resulted in 24 points for the hosts. Oumou Kalsoum Touré took full advantage to help herself to 23 points. For the CFBB Clémentine Morateur led the way with 15 points. Last weekend Margaux Galliou-Loko (in picture) was just warming up as she led the scoring for Cavigal Nice against Illkirch Graffenstaden. This weekend she scored 16 points to lead again the scoring as her team blew away Limoges (93-48). Limoges were in the game for the first five minutes (10-7) and then collapsed. The Niss'Angels had five players in double digits and 42 points coming from the players that came off the bench. However their performance was not perfect because they did turn the ball over 17 times and attempted too many three-pointers. 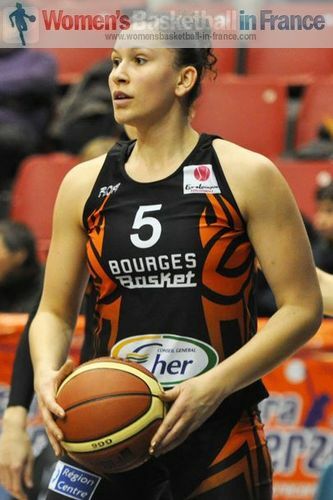 For Limoges Iva Grbas was the leading scorer with 13 points. In the remaining matches US Laveyron beat Reims BF (58-47) in a game that neither side shot the ball well. Pau-Lacq-Orthez was involved in the most exciting game of the day against Angers which they won (86-79). Pau-Lacq-Orthez were deadly from three-point land hitting 10-of-14 while Laurie Lapeyre had a perfect shooting day, 7-of-7 from the floor and 5-of-5 from the free-throw line. In her player-of-the-week performance she also picked up 8 rebounds and dished out 3 assists. Toutes les équipes jouant à domicile enregistrent une victoire avec Pau Lacq-Orthez montrant leur agilité sur le tir à distance pour gagner 86-79 contre Angers avec Laurie Lapeyre (dans l'image) survitaminée avec un sans faute. Limoges n'arrive pas à répondre à la majestueuse formation de Cavigal Nice et perd à nouveau 48-93. Les Niss'Angels confirme leur statut en tant que leader dans leur ligue. Puis Roche Vendée arrache enfin une victoire 69-65 contre Dunkerque Malo et Léon Trégor rebondit de sa défaite et gagne 65-53 grace aux 23 points de Oumou Kalsoum Toure contre la CFBB. Et pas sans difficulté US Laveyron s'impose 58-47 contre Reims BF.